John McCracken’s A History of Malawi and Megan Vaughan’s Curing their Ills. Yes. Fieldwork particularly in the Mzimba District in Northern Malawi had its surprising moments. Of archives and libraries in Malawi, UK and South Africa the most unexpected were perhaps the Royal Botanic Gardens Kew archives, Society of Malawi Library, and the University of Cape Town Archives. All stages had their great moments, but seeing the final chapters take their shape was most rewarding – and seeing the book ready! Getting the book into the proposal stage, and figuring out what this book finally was about (and what was left out). 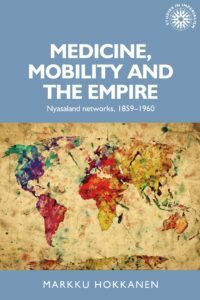 My first book was Medicine and Scottish Missionaries in the Northern Malawi Region, 1875-1930: Quests for Health in a Colonial Society. (The Edwin Mellen Press, 2007). It was great, of course. Happiness and pride (and some tiredness too). MUP is a highly respected publisher of quality scholarship. The Studies of Imperialism series has been an important resource to me since I was an undergraduate, and my research seemed to fit the scope of the series well. Yes. My previous book was based on my doctoral thesis, and as such it was a different kind of monograph. This book had more scope and freedom to write about what I considered important. At times I felt I could write more boldly. I am working on articles/ book chapters dealing with history of quinine in the British empire, alcohol and health in South-Central Africa, history of healing in Southern Africa and questions of medical provision for colonial labour – all themes that stem from this book one way or another. In addition, I am in charge of a Kone Foundation-funded research project about the histories and memories of Finnish development work, which is something largely new to me. As a project with three other scholars, it offers interesting scope for collaborative writing over the next few years.